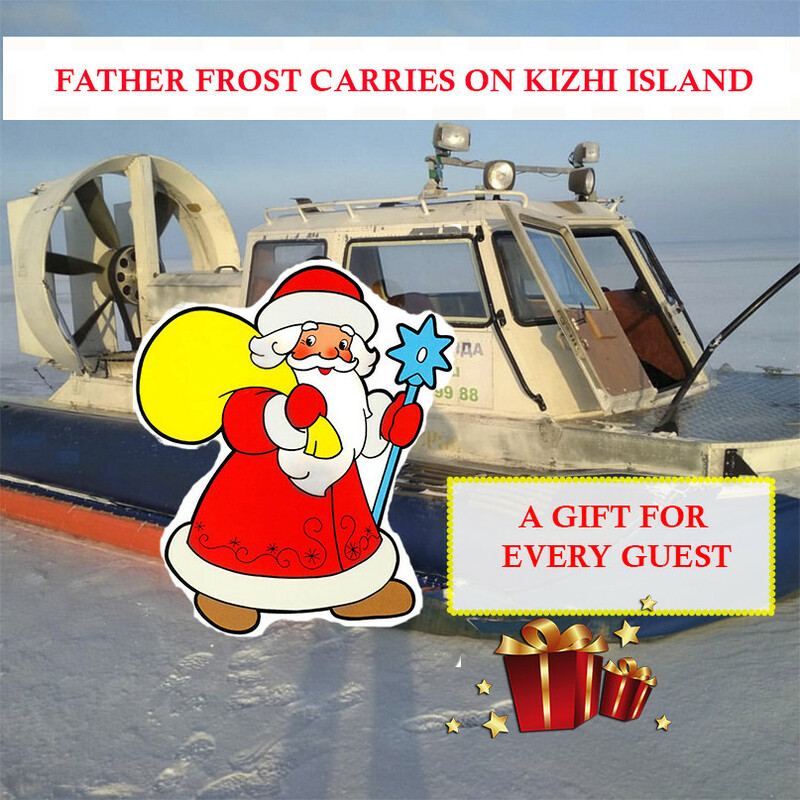 Father Frost carries to the Kizhi Island! Give yourself a meeting with Father Frost on the Kizhi Island in winter. Feel the unforgettable, vivid sensations of traveling on an all-passable hovercraft! Father Frost himself will ride you on air sleds! A gift for every guest! The cost of 5500 rubles per person, discount 500 rubles. for children up to 12 years. We can offer an ECONOMY version of the trip to the winter island. Kizhi – there is nothing extra in it. 06:45 Gathering of group in Petrozavodsk. 07:00 Departure by comfortable bus from Petrozavodsk in the Velikay guba village. 11:30 Landing to the Hivus hovercraft (Velikay guba village). Moving on the hovercraft on an ice smooth surface of Lake Onega to the island of Kizhi (25-30 minutes). 12:00 A sightseeing tour on the main exposition of the museum during which guests are waited by acquaintance to a pearl of the Russian wooden architecture — the Kizhsky architectural complex. During the excursion you examine unique many-domed temples and icon-painting furniture of Church of the Intercession of Kizhi Pogost, you will enter the house of the zaonezhsky peasant, you learn, as well as than there lived these people, will see church of the Lazarus raised from the dead — the oldest in Russia which was esteemed as an orthodox shrine (1 h is 15 min). 13:15 Meeting with Father Frost. Photography. Landing to the hovercraft. 13:30 Moving across Lake Onega to page Velikay guba village (20-30 minutes). 14:00 A tea drinking in the rural house of Velikay guba village.You will be met by the hostess in a national zaonezhsky suit and will treat with hot tea with pies. Order right now, the number of places is limited! The travel will be organized when forming group from 7 people. In case of a group shortage other date will be offered the tourists who have bought the ticket for the program or money for tickets is returned. * Organizers reserve the right to change the sequence of stages of the Travel without damage to his filling.